IRA news site reveals what happened last year on the day before the US midterms. While Amazon's cloud business was only 11% of its overall sales last year, it delivered more operating income than all other business units combined. For Amazon, the cloud is the little engine that could. Amazon Web Services comprised just 11% of the companyʼs overall sales in 2018, but delivered more operating income than all other business units combined. Thatʼs the same year-over-year growth rate (Q4 2018 over Q4 2017) for AWS that it saw in the year-ago quarter (Q4 2017 over Q4 2016). Operating income for AWS was $2.17 billion, up from $1.35 billion in the year-ago quarter. For calendar 2018, AWS sales were $25.65 billion, up 47% from $17.45 billion year-over-year. Sales growth accelerated in 2018 over 2017 compared with 2017 over 2016, which saw 43% sales growth. 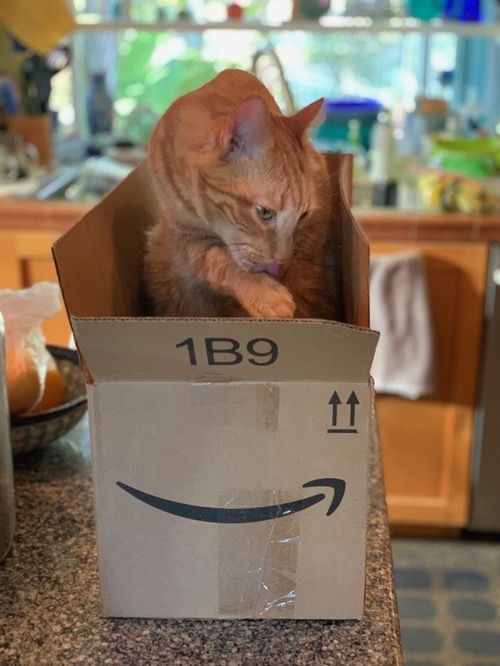 Amazon is cleaning up in the cloud, much as the authorʼs cat cleans itself in this Amazon box. For AWSʼs sales growth to accelerate in that fashion is noteworthy because AWS is by far the leader in cloud market share, ahead of second-ranked Microsoft Corp. (Nasdaq: MSFT) by a wide margin; accelerating growth speaks to overall strength for AWS and the cloud market in general. Operating income for AWS was $7.29 billion in 2018, up from $4.31 billion in 2017. AWS represents a growing share of Amazon.com Inc. (Nasdaq: AMZN)ʼs overall revenue (by a smidge) -- 11% in 2018 compared with 10% in the previous year, and 10% in the fourth quarter of 2018, compared with 8% in the year-ago quarter. And AWS is the lionʼs share of Amazonʼs operating income: Nearly 58% in the fourth quarter of 2018, and nearly 59% for the full year. For Amazon overall, including its mainstay retail business, for the quarter, sales were up 20% to $72.4 billion after a strong holiday season. Net income increased to $3 billion in the fourth quarter, or $6.04 per diluted share, compared with $1.9 billion or $3.75 per diluted share in the year-ago quarter. For the full year, net sales were up 31% to $232.9 billion. Net income increased to $10.1 billion, or $20.14 per diluted share, compared with $3 billion or $6.15 per diluted share in 2017. The Echo Dot was the best-selling item across all products on Amazon globally, Amazon CEO Jeff Bezos said in its earnings press release. "Alexa was very busy during her holiday season," he said. For the first quarter of 2019, Amazon anticipates net sales of $56 billion to $60 billion, up 10-18% year over year. Operating income is expected to be $2.3 billion to $3.3 billion, compared with $1.9 billion in the first quarter of 2018. Amazon stock traded at $1,634 after hours, down 4.93%.